The Big Ten basketball tournament starts Thursday. Penn State will face Minnesota in an 11 vs 6 seed game. I filled out a bracket. Take a look at my computer skills below. One more game and this dreadful season will be over. No NCAA's. 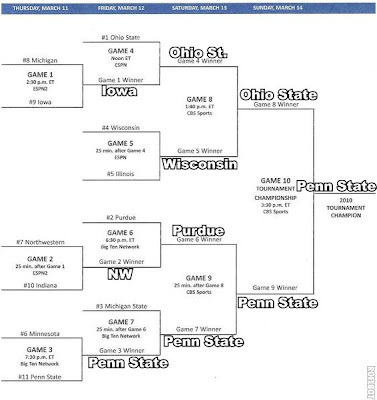 They did play Minnesota tough in both games this year so maybe PSU will win one. Doubtful but that's why they play the games.